Centuries old, the Hippocratic Oath is considered by most to be the fundamental ethical creed of medicine. "I will follow that system of regiment, which according to my ability and judgment, I consider for the benefit of my patients." This promise is severely undermined by all third-party payment systems. When the third party is a private insurance company, at least patients voluntarily agree to the limitations placed on them and their physicians under the insurance contract --although the extent of contractual freedom varies widely from state to state. When the third party is the government, and the restrictions and mandates hold the penalty of law, the voluntary nature of the agreement is changed to one based primarily upon coercion. The more the government mandates, the less the physician is able to legally offer advice and treatment based solely on his "ability and judgment." Instead, physicians are increasingly required to substitute their judgement and advice for the judgment of politicians and regulators. Paperwork is also taking more and more time away from patient contact and direct patient care during medical training-as much as 6 hours a day! This trend will only worsen with the recent massive increase in health care laws and regulation. Medical training used to emphasize how to think in essentials and document only the information directly pertinent to the medical condition and care of the patient. This simplified future information retrieval–by oneself as well as medical colleagues. Now the essentials are buried in a morass of details required for payment and as protection against malpractice suits. The switch to electronic records are no panacea as studies are showing they do not decrease administrative costs, only ”might modestly improve” quality of care provided, and may actually slow doctors down. In addition, electronic records combined with reporting requirements put patient privacy seriously at risk. Doctors can spend time focusing on patients and their medical needs, or they can spend time being sure their paper trail is properly covered. More time on paper work means less time for patients. Just one more way that the new laws are putting the government in between patients and their doctors. 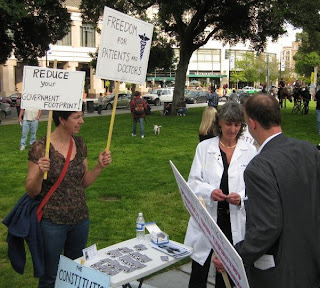 The San Jose Tea Party was a great introductory day for The Black Ribbon Project. I talked non-stop with interested and concerned individuals--listening to their stories of how much they appreciated the wonderful care they have received from their doctors. We gave away over 100 pins and received many generous donations. What impressed me most was that each person had a story to tell about the importance of quality medical care in their lives. The personal doctor-patient relationship is a highly treasured value which they understand is threatened by the new health control laws. Many expressed concerns not only for themselves as patients, but for the freedom and respect which they believe their physicians deserve! The pins provided them with a way to express their support. All in all, a very satisfying experience which raised my spirits about the generosity and the intelligent spirit of independence which characterizes so many Americans. Thanks to all of you who made this an uplifting day. This ribbon is to raise awareness of the recent damage our government has caused to health care freedom and the integrity of the doctor-patient relationship. Under the new laws (PPACA), physicians will be compelled to base their advice and treatment on politically determined goals, even when in conflict with the best interest of their individual patients. The Patient Protection and Affordable Care Act, signed into law on March 23, 2010, legalizes multiple infringements upo our rights to life, liberty and property. The government has been given wide and arbitrary powers to regulate, restrict and control not only the health insurance industry, but the provision of health care itself. Employers and employees are no longer free to negotiate their own compensation packages but must fulfill the governments mandates for health insurance benefits. Our most productive citizens and businesses will have a greater portion of their assets taxed away by the government to pay for increased entitlements---leaving investors and entrepreneurs with less money to expand employment, or create new businesses, or take risks on innovation. The combination of guaranteed issue and community rating makes true health insurance illegal. The harmful incentive system of third party payment is further entrenched and expanded, guaranteeing health care expenditures to spiral upward while simultaneously divorcing costs from efficiency-creating market competition. Expansion of government's role in health care will eventually lead to price controls and rationing throughout of all health care--instead of existing primarily in Medicare and Medicaid as it is now. Controlling costs must include controlling expenditures--which means that the government will have an increasing say in the medical decisions which previously have been left to a patient and his doctor. Some individuals will benefit from this new law, and will do so in obvious ways. Many more people will suffer, but in ways that although directly traceable to this law are not obvious. 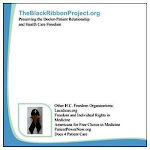 The purpose of the Black Ribbon Project is to call attention to the multiple ways that the new law undermines our freedom, erodes our prosperity and prospects for economic progress, and interjects politics into the private and intensely personal decisions which properly belong to physicians and patients. 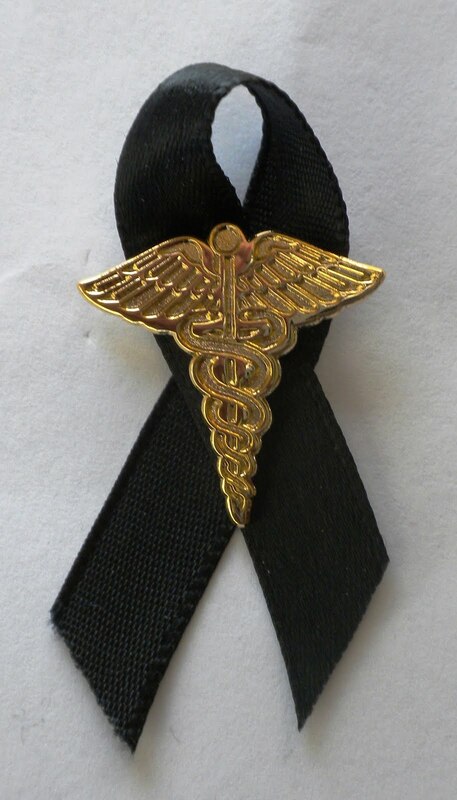 We are now accepting contributions to distribute black ribbons accompanied by a caduceus pin to symbolize the destruction of health care freedom and the political undermining of the integrity of the doctor-patient relationship. This project is just starting out. Comments, suggestions, offers of help are welcome!! Update 4/10/10: The project explanation has been expanded. Also, I have slightly increased amount of donation requested in order for the project to be self-sustaining. Straight donations are very welcome and will allow us to increase outreach and distribute more information with the pins.